Leg Cramps provides relief of symptoms of cramps and pains in lower back and legs, quickly stimulates your body's natural healing powers to stop the pain. Yes! 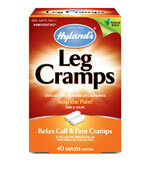 Stand up to leg cramps! However, as always, you should check with your birth practitioner before use. Restful Legs temporarily relieves symptoms of the compelling urge to move legs to relieve sensations of itching, tingling, crawling and restlessness of legs. However, as always, you should check with your birth practitioner before use.